Istanbul (Agenzia Fides) - During the Easter season "the friars, together with the people they serve, live the joy of the Gospel and represent a bridge of dialogue with people of other religions, especially Muslims and Jews": it is particularly true - says a note sent to Agenzia Fides - for the Franciscan friars of the "International Fraternity for Dialogue" established by the Order of Friars Minor in Istanbul, who follow the footsteps of St. Francis, who met the Sultan Malik-al-Kamil in Damietta in 1219, and are preparing to commemorate that meeting, 800 years after that event. As Fides learns, the fraternity was created by the then Minister General, Friar José Rodriguez Carballo (now Archbishop, Secretary of the Congregation for Institutes of Consecrated Life and Societies of Apostolic Life) and officially opened in 2004, as an expression of commitment of the Order of Friars Minor for ecumenical and interreligious dialogue. His foundation home is the parish of Santa Maria Draperis in Istanbul, Turkey, where the friars also serve the parish of Saint Louis on the grounds of the French Consulate. 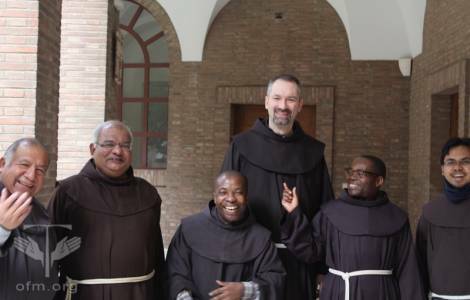 "Given that only 0.5% of the local population is Catholic, all what the friars say and live touches the sphere of dialogue: from work to spiritual and theological exchange. Since Islam is the predominant religion in Turkey (98% of population), the Sunni Muslims, Alawis and Sufi are the main partners of the dialogue, but there are also excellent relations with the Orthodox and Protestant Christian communities", says the note sent to Fides by friar Eleuther Makuta, Friar Minor of the Democratic Republic of Congo and in charge of the community. "Cultural pluralism - he recalls - marked every aspect of the Holy Week, from the ecumenical ministry in the prison on Holy Monday to the Easter Vigil lived together with the Italian, English, French and Spanish parish communities. There were visits by the Muslim civil authorities. Since the Catholic parishes are so closely linked, many liturgies are celebrated in common, to increase the sense of unity that is at the center of the Paschal Mystery". Friar Eleuthere Makuta explains: "In Turkey, one immediately perceives the catholicity of the Church: here Christians are daily called to bear common witness to the Gospel, especially in the face of the great challenges they face, such as the current migration of refugees from the Middle East and Africa".